Protein argonaute 1 (AGO1) is an RNA Slicer that selectively recruits microRNAs and siRNAs. 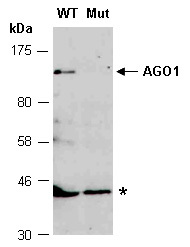 There is currently no evidence that AGO1 Slicer is in a high molecular weight RNA-induced silencing complex (RISC). Mutants are defective in post-transcriptional gene silencing and have pleiotropic developmental and morphological defects. Through its action on the regulation of ARF17 expression, AGO1 regulates genes involved at the cross talk between auxin and light signaling during adventitious root development. AGO1 seems to be targeted for degradation by silencing suppressor F-box-containing proteins from Turnip yellow virus and Cucurbit aphid-borne yellow virus. Rabbit polyclonal antibodies were produced by immunizing animals with a GST-fusion protein containing the C-terminal region of arabidopsis thaliana AGO1 (At1g48410). Antibodies were purified by affinity purification using immunogen.